Many of my clients and friends know the story of how my fiancé and I met. If you didn’t its in the Arizona Republic today. Also, only so much of what you say in an interview gets included in stories…I thought I gushed more about my darling husband to be, but that didnt make the story. I cringed at the “serial dating” sentence, but I did say it and it did tie into how the story developed. Sonja Haller was the writer and she’s been a great person to work with at the paper. She’s always looking for good, interesting stories for the LOVE STORY section and others, so contact her if you know a great one. 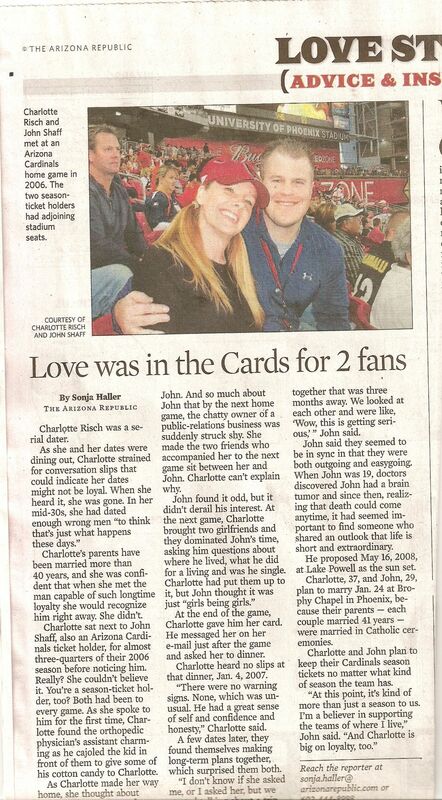 This entry was posted in blog and tagged arizona cardinals, arizona republic, Charlotte Risch, love story, phoenix, valley pr blog. Bookmark the permalink.